Below: from the Trenton [New Jersey] Evening Times, Aug. 14, 1916. I suspect that the Gotham and Venus pads were of paper to be burned or tossed or flushed; washing cloth pads was a problem for women traveling. See an actual later Venus compressed pad, maybe the same one. See a sanitary apron. See some menstrual belts. Below: ad from Appleton [Wisconsin] Post Crescent, Feb. 11, 1929. 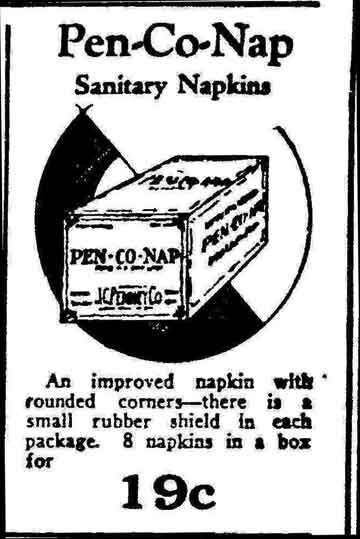 J.C. Penney, which operates today, sold its own brand of menstrual pads just as Sears and probably many other stores did. Below: from the Fort Wayne [Indiana] News, Aug. 30, 1912. If there can be paper diapers, paper menstrual pads can't be far behind, which of course was the case. See sanitary bloomers possibly based on children's diapers. Below: from the Oakland [California] Tribune, May 22, 1919.